Westone Style AQ swimming and high noise ear plugs were originally designed for use while surface swimming or showering to prevent moisture from entering the ear canal. 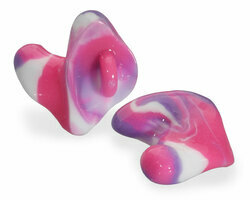 However the AQ is also one of the most effective sound attenuating custom-fit ear plugs you can buy. Note that Style AQ ear plugs do such an excellent job at blocking sound, that you may actually prefer a different swimming ear plug that allows more sound to pass through (see Westone Style 70 Surfer Ear Plugs). Style AQ ear plugs are really best for situations in which you do not need to be able to hear what's going on around you, such as voices or safety alarms, whistles, etc. Available in a variety of colors and color combinations, with a Noise Reduction Rating of 27 dB. Upon request, we will create a unique swyrl design using two or three colors you choose (extra charge applies). 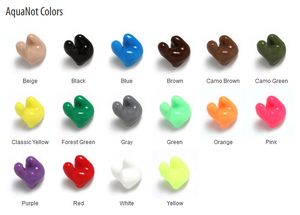 Westone Model AQ swimming and high noise ear plugs are made of Silicone Aquanot material.